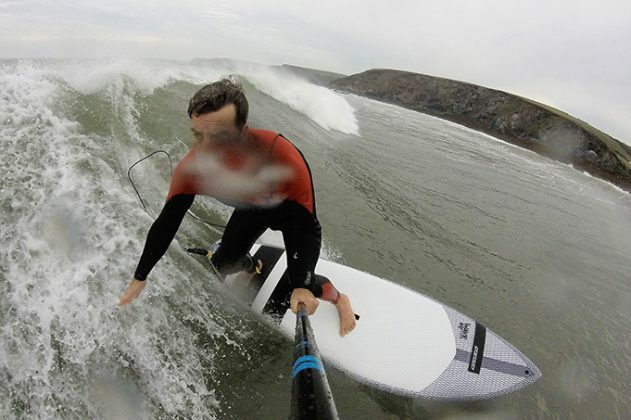 RRD have put together a no compromise full performance Pro SUP with their I-Wave range. Built to the lightest weight spec the RRD absolutely rips on a wave, it turns incredibly well and drives speed out of your moves with it’s fairly finned up feel. The I-Wave feels super light underfoot, is well rockered and is eager to turn as soon as it’s up on a wave. For those seeking pro board performance in the lightest possible weight, the RRD has got to be a top choice; very attractive with performance to match. Wrapped entirely with the Vectra carbon net, the RRD test board came in a fair bit under the quoted 6.6kg weight. On deck the deck is fairly flat and the board has a good length diamond cut decked with tail kick and a small ledge handle, and a full length carbon stringer. On the well rockered nose you have a camera mount insert and on the tail a twin leash plug. Underneath, the RRD again has a full length carbon stringer and a slight concave on the nose runs through to vee right through to the tail, where quad and thruster future boxes are fitted. The rails are fairly chunky right the way through the board. 4 new shapes for expert level only, used worldwide by advanced riders that want to push the boundaries of the sport or compete as professionals. The shapes and construction technologies keep evolving depending on the latest trends on sup wave riding, and the I-Wave V2 represent the latest status quo of the sports’ evolution. Available in full LTD technology with Vectra carbon fabric on CNC EPS core, finished with matt pro speed paint and carbon net layup top and bottom. Bamboo sandwich stepping area and a superlight composite carry handle box. Make no mistake this board is definitely a pro performance board and very light weight – our test board came out under 6kg so naturally felt very alive on the wave, Paddling into waves the RRD needed a little persuasion with its high nose rocker but this also gave you plenty of faith taking super late drops where nine times out of ten you’d get away with anything. The vee throughout the board gave the RRD an easy rail to rail transition and the good size grippy glass fins gave tons of drive throughout the turns so the board carried speed well. The rails were fairly chunky from the mid-point back. The construction on this very light board looked great with it full wrap on Vectra carbon net (double on the rails), however in the short period of our test window the board’s deck was showing signs of wear before long under the standing area, the handle was very slightly to far forward too, but there are only minor issues for such a pro performance wave board. We loved the drive out of the turns, the eagerness to hit any section and the high rockered nose which helps you out of re-entries time after time. The I-Wave delivers a custom look and feel off the shelf forriders wanting the ultimate performance board. It’s a dream to surf, very light weight and grips and turns fantastically well, one of the best performance wave boards we’ve tested.